Spring inspires me, not only to adapt my personal style to the new fashion trends but also to refresh my home decor. Around this time, every year I change the centerpiece decor in my living room, as well as the decoration on our dinning table. Stay tuned for my next DIY post with my new flower arrangement. Last week was so busy, I was planning a lunch with friends in our house plus my daughter was moving in her new home . No wonder, we were both into searching online inspiring houses and creative decorating ideas. Usually, I browse fashion related blogs and sites but I have to admit I enjoyed the change. Here are our favorite 5 easy decor ideas that can refresh you home style. Get inspired by fashion designer Malene Birger’s home in Copenhagen and place your pictures with different frames on a shelf one next to the other. Use pictures or gravures with same theme and frame them all the same way. 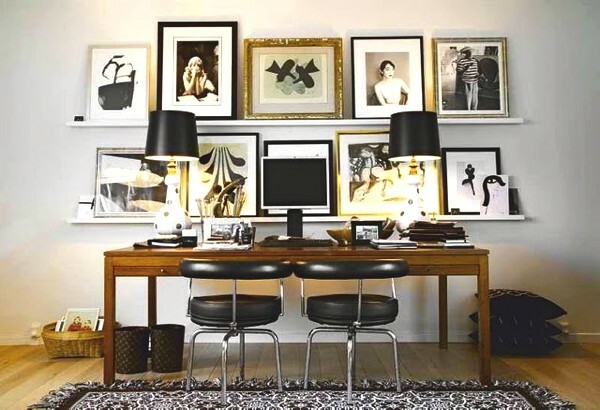 Arrange your new pictures on the wall in three rows creating the illusion of a big square painting over your couch. 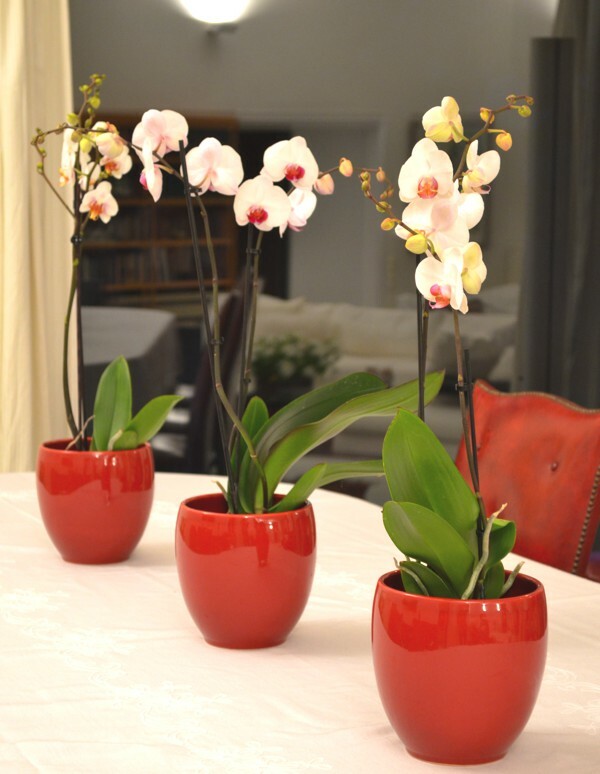 You can get three orchids and place them on your dinning table one next to the other. I used the red pots from my Christmas decor and changed the plants. In between the orchids I usually add square candles. Add a big plant for maximum spring flair impact like the one Keri Russell used in her Brooklyn home living room as seen in Elle Decor. Such a cool easy to do decorating idea. 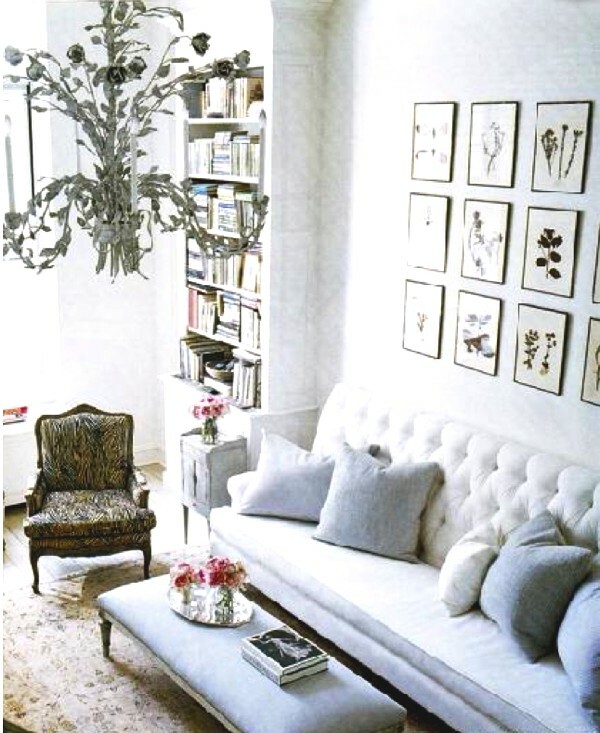 Just get an extra big clear vase and add some almond tree branches. Love this kind of post, great tips! I love the simple and effective two shelves of pictures because that is easily doable. Oh, I love all the white and that pic with the two rows of pictures is just great! This has inspired me to go buy some fresh flowers! The tree blossoms look amazing. Very nice ideas. Thank you Daniella, I use to write in a magazine about interior decoration and I miss it some times….